We’d love your help. Let us know what’s wrong with this preview of Life In New York by Laura Pedersen. To ask other readers questions about Life In New York, please sign up. 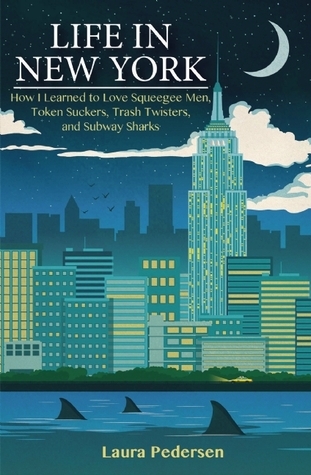 Pedersen takes the reader on a interesting historical and humorous tour of New York City with its distinctive idiosyncrasies and uniqueness making this accepting patchwork city the pulse of America. Pedersen shares her observations and evolvement with special interest focused on the 80's not excluding stepping back in time to colonial days while dipping into current times. I found myself laughing out loud often as I read Pedersen's descriptions and comments on varying identifiers one associates Pedersen takes the reader on a interesting historical and humorous tour of New York City with its distinctive idiosyncrasies and uniqueness making this accepting patchwork city the pulse of America. I found myself laughing out loud often as I read Pedersen's descriptions and comments on varying identifiers one associates to New York. If you're familiar with New York or if you've ever wanted to visit - Pedersen's 'travelogue' will entertain you as well as inspire a trip to this maniacal, quirky, vibrant city to see for yourself or reexperience the energy. Her no holds barred style is spot on describing all the calm and chaos of this one of a kind city. "The one constant throughout New York City's history has been its ability to change,adapt, and reinvent itself. Restless energy is a defining characteristic." I have not heard of Laura Pedersen. However after reading this book, I will be getting to know more about Laura Pedersen. This book does showcase some of Laura's comedic side. I found myself chuckling a few times through out the book. In fact, some passages were so funny that I had to re-read them again. For example: When Laura talks about the squeegee men and that it was surprising that Stephen King had not written the book "Squeegee Man: Vengeance at the Midtown Tunnel". Jaywalking is an art f I have not heard of Laura Pedersen. However after reading this book, I will be getting to know more about Laura Pedersen. This book does showcase some of Laura's comedic side. I found myself chuckling a few times through out the book. In fact, some passages were so funny that I had to re-read them again. For example: When Laura talks about the squeegee men and that it was surprising that Stephen King had not written the book "Squeegee Man: Vengeance at the Midtown Tunnel". Jaywalking is an art form, wearing pajamas out in public is fine in New York, in Chelsea it's a fashion statement, Upper West Side your crazy, Upper East Side your considered eccentric, Village-your's just one of the people, and in Little Italy you could plead insanity. There is Laura's time when she was renting early on in her life that was near a Ferris wheel and she flashed people (which is not uncommon to see naked people in the city). Anyways Laura said she could not tell if the ticket sales went up or down due to her peep show as she did not receive a cut of the profit from the ticket sales. What a fun book to read. This book did not disappoint, tho honestly it still doesn't push me to go visit again. New York, I won't be back, but if your a fan this book is for you. Fun nevertheless! Entertaining and informative five stars! I have been to New York once if you count looking out the windows of JFK on my way to Spain. I have always wanted to go and see the city for real. This book was hysterical I laughed so hard in place that I cried. It has a little bit of everything history, humor, and a good guide to the city. I really felt like I have been there now after reading this book and it just boosted it up a few notches on my places to travel list. This author is engaging, and giv Entertaining and informative five stars! I have been to New York once if you count looking out the windows of JFK on my way to Spain. I have always wanted to go and see the city for real. This book was hysterical I laughed so hard in place that I cried. It has a little bit of everything history, humor, and a good guide to the city. I really felt like I have been there now after reading this book and it just boosted it up a few notches on my places to travel list. This author is engaging, and gives you a guide of the city and the history that is compulsively readable. I really enjoyed this book and will be looking at others from this author. Best compilation of (her own) quotes about NYC, (not made up) facts, and hilarious but true only-in-New-York stories. Pedersen unwraps the city in all its glories and grumblings. Love the part about her grandfather watching the Empire State Building go up and the Native American "Skywalkers" - fearless Mohawks who built the steel framework. I seldom laugh out loud when I'm reading but this book had me laughing all the way through. Pedersen's observations are keen and hysterical.Very clever and amusing. She came to NY exactly at the same time that I did, and I didn't realize what I saw, when I saw them, until I read this book. And it's interesting to think of how things changed over the years !! !